This combination unit includes two Barrier-Free drinking fountain decks similiar to Murdock's A172 Series. Each drinking fountain features a round vandal resistant push button. 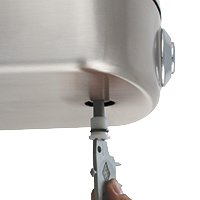 It also includes a H2O to go!® Sensor Activated Bottle Filler (BF12) that sits on the lower drinking fountain deck. Mounting frame with a trim panel is provided. This unit does not provided refrigerated water. Electrical is necessary for the sensor operated bottle filler. The patented Push Button Auto Stop feature is part of Murdock A192-VR units. It seamlessly incorporates the heavy-duty Vandal Resistant button for additional security while allowing easy access to the push button for routine maintenance.